Town of Wallkill - Clothing signs were in the window. The merchandise was on clearance and Keith Moulton was ready to shutter Foeller's Men's Shop, unable to find someone to buy the store that had clothed local men since 1945. Middletown preserved by the new. 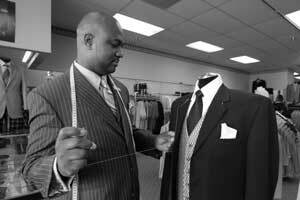 The longtime clothier, which specializes in "big and tall" suits, will continue under Thompson. It will be one of the only local men's stores left in an industry increasingly dominated by big retailers. It's a Middletown institution, but, like much of Middletown, it's changing. Thompson, who moved here five years ago from Jamaica, said he's hoping to attract a younger clientele, while continuing to serve the store's longtime customers. "We'll be carrying on the standard that Foeller's has carried over the years," said Thompson, clad one recent morning in a black pinstripe suit, a blue shirt and a light orange tie with pocket square to match. "And we're thinking of getting even better." Foeller's will continue to offer custom tailoring and made-to-measure suits. It'll still carry its traditional lines, and it will add some trendier ones, like Armani, Canali and Tallia. "We'll have suits a guy would think he has to go to Nordstrom to get," Thompson said. To succeed against the big boys like Nordstrom, Foeller's must carve out a niche, said Don- ald Green, director of continuing and professional education at SUNY Orange. Green, the former CEO of Green's Department Store, has some experience on that front. There's a market for good personal service, Green said. Shoppers might be willing to spend a little more for a hometown touch. "I think people really want an alternative to the mass merchandising type of retail that's so prevalent," Green said. In recent years, service is what Foeller's has focused on. That, and "big and tall," a fast growing piece of the menswear industry now worth billion a year. But locally, there's little for the big and tall man, Thompson said. He saw that and jumped at the chance to buy Foeller's, where he'd worked part time sewing suits. learned the trade in his native country, where fashion is important, he said, and fine tailoring has been handed down from British colonial days. Now he's bringing it here, adding to Middletown's ever growing mix of cultures. "Fashion is like that," Thompson said. "We bring our skills to America, to be a part of America." He's also bringing new life to a business that was on the verge of closing. Moulton had worked at Foeller's for 44 years and was ready to retire. He'd wearied of battling the national retailers that surround his store in the Dunning Farm Shopping Center. "The big guys come in and eat up the little guys," Moulton said. "I'm glad to see a little guy stay around." And Thompson is glad to do it. With personal service, fine suits and a new spark, he hopes to carry on what's long been a tradition at Foeller's. "We want to see people elegantly dressed," he said.